The Perspi-Rock® brand denotes a product that will provide 100% natural protection from sweat and odour, using traditional techniques entirely free of chemicals. 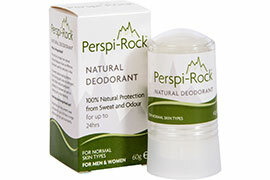 Perspi-Rock Natural Deodorant is entirely natural, made from natural Alum crystals from mines across Asia. Perspi-Rock® products are available to order from The Antiperspirant and Deodorant Company and other leading retailers.